First off I joined this site just to make this thread and contribute to other threads to share the method. I could not for the life of me find a thread who fixed a cable/motor setup like mine. 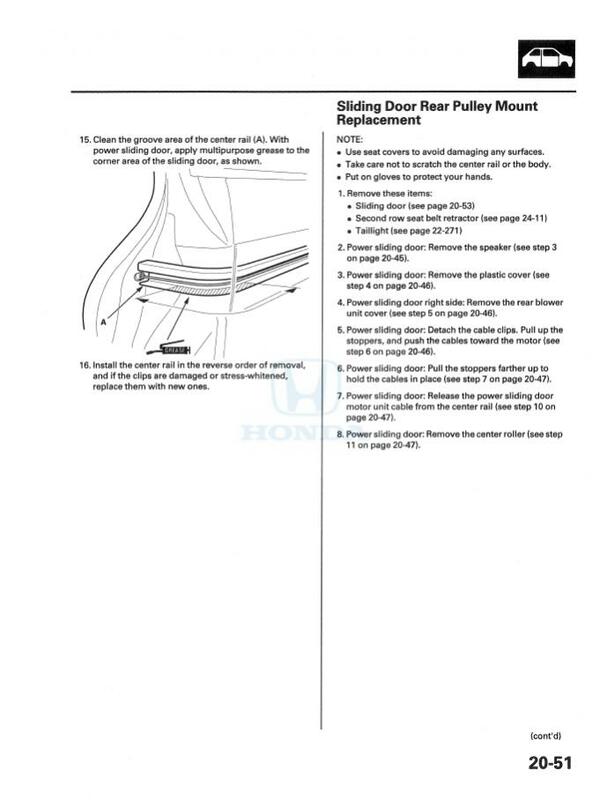 I am not sure when honda changed the sliding door motors. 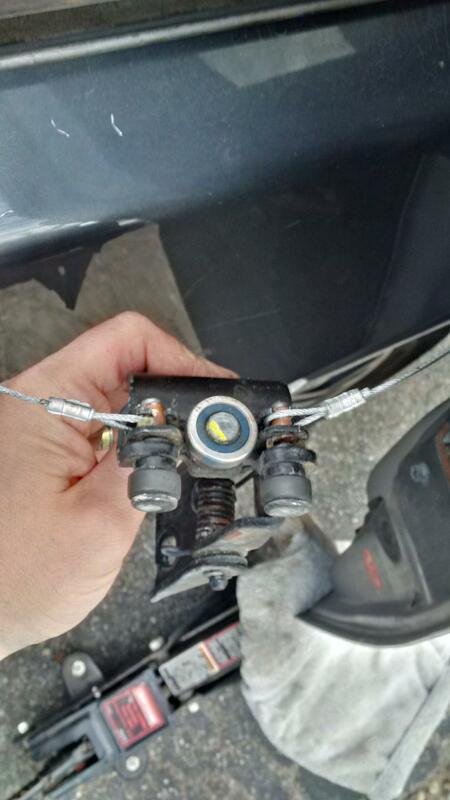 Who wants to spend over $1000 bucks at the dealership for a whole new motor assembly when its just the stupid cable? I used 90% of the methods described in this thread which is for a 2003 model, the other 10% is adjusting to the newer motor/cable design (big thanks to sizzlemp). I thought I would have the same setup, so seeing this DIY thread gave me confidence but things are different in at least 2011 and above. VERY gently pull the large panel out. I damaged mine a little bending it. Oh well. DON'T buy the green coated 1/16 cable, this is slightly too thick for the cable sleeves and the pulley. I just went with the 1/16 uncoated and it seems to be holding up fine. There are probably better quality cables that are thinner and coated. I looped the lugs and crimped with a swaging tool, it provides a very tight crimp. I tried the other way other folks had success with but the cable got pulled out of the lugs. There are a ton of other ways to do it if your read through sizzlemps thread replies, but this way worked with what I had on hand (I dont have a solder setup, etc). This is the tool I used, its $20 from home depot: Lehigh Swaging Tool-ST18S - The Home Depot. The circular stop ferrule for the other end (pulley) is tricky, I had to wedge some cardboard into the swaging tool on the hole above the 1/16 to get a nice tight crimp. It takes some patience, but I got it small enough to fit into the swaging tool 1/16 hole, crimped it, and filed the rest off so it could fit inside the pulley. Since I used uncoated cables I put anti seize all around the pully so the cables have some form of lube. Lithium is probably better. I did not measure the lengths, sorry. I bought around 16 ft to be safe in case I screwed up and that turned out saving a trip back. I lined up the old cables and added about an inch and a half give or take to account for the loop at the lugs. I swear my motor was confused at first on its state, because hitting the close button up in the front was causing it to open and vice versa. I disconnected the negative terminal and let the whole computer reset. WARNING, make sure you have tour radio code if you unplug the battery!! All in all it took me a half day altogether because I didn't really know what I was doing at first, but figured it out. I hope this info can help folks that run into the same problem. I also pieced together a video to really show the motor mechanism which I was desperate to see somewhere else, but also point out the above. Good luck if you take this on. Its worth it, very doable and it pays off! Nice job. The 2011 motor looks way different than the 2003, but the operation looks similar. Thanks very much! Wish I'd had this info about the 2011 model year before I spent that $1000 bucks at dealer. And a word to those who live in the north - Don't leave it outside to freeze!!! Yeah it does look a lot different. I may have routed it incorrectly once or twice, I am lucky I did not damage the threaded pulley. Thanks again for your ideas, they worked great. Last edited by ventnuts; 03-21-2016 at 09:19 PM. Thanks, wow now these are professional cables. If these fail me I will be checking these out. Haha yes its been a pretty fair winter unlike last year that's for sure. I fixed this in February outside on some warm days. Last edited by ventnuts; 03-21-2016 at 09:23 PM. Working through cable replace on passenger side of 2011 up here in NH. I have two attempts at wire replace but both have ended in fails, once too short, once too long. Having a lot of trouble getting the cable length correctly set and haven't seen a lot of mention about this in this or the sizzlemp write up for the 2011 generation of the van. Do you remember how you went getting the length? Assuming the 6; 1" and 5' 9" in the posts for the earlier generations don't match on the 2011 gen. Here are the steps I am taking and would welcome any suggestions. 1. Buy 13' of cable and cutting it in half and I ferrel one end on each piece. 2. Wind it up on the spool nearly completely for the front, which leaves a half wind for the rear. There is less than 1/2" of open rail on the spool without wire after this part is set. 3. Feed the wire through the Front and rear 'housing' arms that extend from the motor and bring the wire to the exterior of the car. 4. With door in full open position take wire and attach to the terminal lugs. In first case rear cable 'bound' up by 1/2" on the rear side forming a 120 degree angle that brought this part of the cable out of the spool near the rear farrel point on the spool. Easy I though, just cut out 1/2" of cable, re-farrel on the inside of the car while everything is still rigged up and should work. But instead I came up short after the adjust and wire was too taught. Thinking now that the adjuster pulleys were likely fully extended when I got my original 120 degree kink and that I didn't have the extra slack I thought I did. Anyway, would welcome advice. If I fail at round 3 I have to resort to used or new motor, wifey won't be into my burning another weekend to further my 'self-education'. Oh and one other thing, have you had any trouble up here with cable freezing in the winter where it meets the rubber housings to head to interior of car? If I remember correctly, the rear cable wraps around the bottom of the pulley while the front cable wraps around the top grooves (closest to the interior of the car). When I did mine, I was very careful to make sure that all of the bottom grooves were filled and the front cable only had a little bit of wrap on the pulley (maybe and inch or so). I then fed the cables through to the bracket with plenty of extra length. With the door in the fully open position, I attached the back cable (might have noted the length and attached with the bracket loose - can't remember). Then I loosely attached the front cable by clamping it with vice grips. Next, I used a couple of pencils to create a gap between the spring loaded tensioners and the case of the motor. This allowed me to get the cables as tight as possible by hand and then the springs would take up the rest of the slack once I removed the pencils. In hindsight, the 1/4 inch or so I used may have been a bit much since it's makes a little bit more noise from the spring tensioners slamming home. Trim the cables after you get them crimped on the outside and are happy with the way it moves. It's fiddly work for sure, but certainly doable with some patience. For those looking for cable that's a bit better than the uncoated 1/16" hardware store cable, I was able to track down some stainless steel wire rope that was nylon coated. The stuff I bought is no longer available, but here's the description. It cost me $20 shipped for 100 feet, which of course is way more than needed for even both sides, but I feel like it's better than having a rusty cable on my fancy kid mover. This stuff was super flexible and easy to work with. ventnuts, you are totally da man. Mine busted on the right side, I couldn't believe the horribly undersized cable they used (I wish I'd saved the rusted frayed busted end, I doubt it was even a 1/16th). Complete crap. My initial impression was "engineered to fail on purpose, just after the warranty expires". Stainless? Galvanized? Judging from the rust at the break, honda don't need dat. It was coated, with a crap coating that cracked, let in the moisture, which the mildest cheapest steel known to mankind happily gobbled up. I sure hope HondaJet doesn't build the planes with cables like this. Does anyone actually lube the cables as the service manual states? You're supposed to lube the cables where they wrap around the front of the track. The cable rubs there. Same with the rear. I'm guessing some regular lube to the coated cables, as recommended, would extend their life substantially. The Owner's Manual says nothing about maintenance for the sliding doors or the cables. Maintenance minder also does not mention anything for those parts. Those are the two primary documents that guide an owner what to do. The service manual (which must be purchased separately) tells you how to do it, but does it tell you when (I don't have it in front of me)? Am I missing something? That being said - I agree that a little lube can work wonders to reduce wear on components. There's lots of maintenance that should be done that's not on the Maintenance Minder and not in the Owner's Manual. I didn't know about it until I found it in my service manual. When I replaced my rear center roller I lubed the cable as per the manual. Here's the page from my 08 service manual. It's in the section with door motor/cable replacement. I think the '11 and up are similar. If you live in the rust belt there's lots of maintenance you should do that isn't necessarily in a vehicle owner's manual or Maintenance Minder. The page you referenced is almost exactly the same for 2011, but it's in the section for replacing the center rail. This suggests that it is only necessary if the rail is replaced for some reason. I agree that there's probably a lot of stuff that should happen to my car living in the rust belt that is not in maintenance minder or the owner's manual. Even the service manual doesn't tell you how often you should lube the track. Maybe there's something else that dealer techs are given that outlines when such tasks are to be done, however it is far from obvious to the lay person that these items are needed. By contrast, when I look at the maintenance schedule for my 2005 Mazda 6, it specifically calls for lubrication of door locks and hinges. I can appreciate that Honda is attempting to simplify the maintenance of their vehicles with maintenance minder, but it should not be condensed down to such a point that things are omitted that lead to failures. If the cable lasted forever without lubrication, it wouldn't matter. However, it does not, so I feel like it shouldn't be buried so deep in the service literature. Rant over. Lube is good people! Update: The passenger side started acting up again from too much slack. It would jerk alot during closing, sometimes opening back up because it (falsely) detected and obstacle. I redid it with 1/2" spacers under each spring loaded roller. I accidentally cut off too much cable the first time and had to redo the back cable. I was actually able to fish it through from the outside very easily. With the new cable routed, I pulled it as tight as possible when attaching it to door bracket. After the repair, the passenger door works even better than the driver's side, which is still stock from the factory. I'm glad I got plenty of extra - that cable works great and is really easy to work with. If only I had found this thread YESTERDAY! My passenger door (2011) jammed/wouldn't close while she was at the post office with both kids in the back (ages 1 and 3) in a very windy rainstorm. After trying for a few minutes, she called me to come rescue her. All in all, it took me close to an hour to coax it closed after trying the fuse resets and anything else I could find on google. This morning I spent $150 for the dealer to say that "I need an entire new actuator" to the tune of $1135. I told them to cut the cable off and I'll use it as a manual door until I can get it fixed. Now I just need to pull the interior panel and see if the actuator is actually stripped/broken or if it was just a bad cable. Worst case I'll find a used actuator at a salvage yard. Looks like they go for $200-250 instead of the $575 my dealer wanted or $380 you can find a new one for online. Any tips for pulling the interior panels? Cable snapped for sliding door. Can cable only be replaced?